I thought I'd include this monument here seeing as it's so similar to Kendal's Elba and Castle Howe monuments. It's off the beaten track...on a road called the Queen's Way, the A712, that runs from New Galloway at the Northern tip of Loch Ken, South to Newton Stewart, and sandwiched between Wee Doon and Big Doon! The road is such that, if you're driving you'll probably miss it...but if you're lucky enough to be a passenger, the monument can be seen looming ahead of you as you pass by the Wild Goat Park. Above. The monument from the East. The monument was erected in 1835 in memory of Alexander Murray (1775 to 1813), a Scottish linguist and professor of oriental languages. Alexander was born very near to the site of the monument, in a cottage called Dunkitterick Cottage, now set up as a memorial to him. The monument was built by William Hume, James Thomson, and Robert Hume to designs by an eminent Edinburgh lawyer called John Parker. It stands to around eighty feet tall, and its prominent position high up on the hill side gives you great views back down the valley to the East. Above. A closer, cropped view of the monument. This has to be one of my favourite drives.....which will have to be done in drier and sunnier weather. There is so much to see along the way, including the Glen of the Bar, the Wild Goat Park, Kenmure Castle, Clatteringshaw's Loch and Bruce's Stone, the Deer Range and miles and miles of rolling hills. The Castle Howe monument stands on the summit of the motte of Castle Howe, Kendal's Norman castle, to the West of the town. The monument was designed by Francis Webster, and bankrolled by William Holme. It was erected to celebrate the 1688 revolution, whereby King James II of England was overthrown by Parliament, and William of Orange, the Dutch Stadtholder, ascended the throne as William III along with his wife Mary II. Above. The monument from the foot of the motte. The monument was erected one hundred years after the Glorious Revolution. It's apt that the inscription mentions 'Sacred to Liberty'. The Liberty quoted here relates to religious freedoms slowly beginning to creep into society....and Kendal has a long history of Dissenters....Catholics, Wesleyans (Methodists), Quakers (Friends), Zionists and many others. Above. The plaque on the East face of the monument. Above. Another view from the foot of the motte. The base of the monument was also found to be of poor quality, and either from the weather or the idle hands local youths, it started to deteriorate. Unfortunately, repairs that were undertaken gradually erased an engraving that had been placed here, once reading "that no foreign prince or potentate has, or ought to have, any power, civil or ecclesiastical, within these realms". Above. The monument and the motte and bailey castle from Kendal Castle to the East. The monument has developed a gentle lean over the years, and this is still evident today. The monument is clearly visible from Kendal Castle to the East, especially during the Autumn and Winter months when the trees are bare. 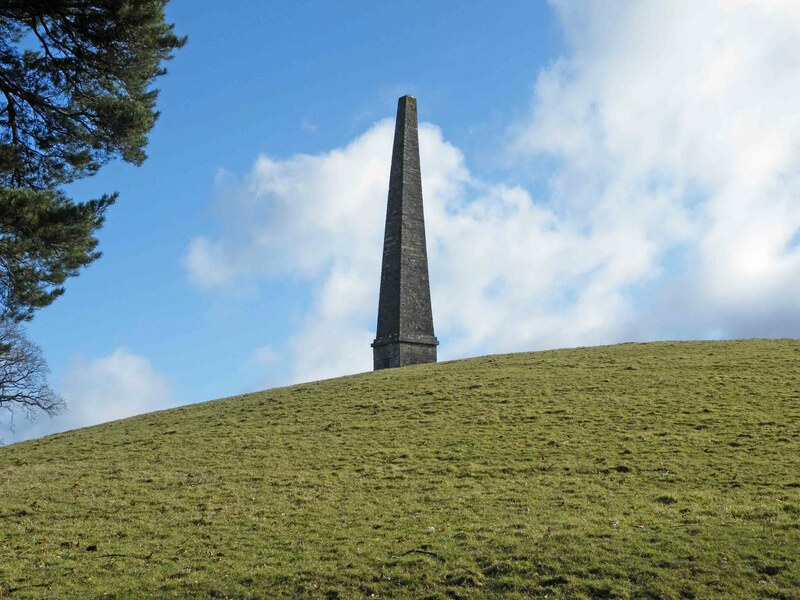 The Elba monument is to be found about a mile North West of Kendal, on Monument Hill just off the A591. You can see it towering above the fields on your right as you drive out towards Windermere. Above. The monument from the West. 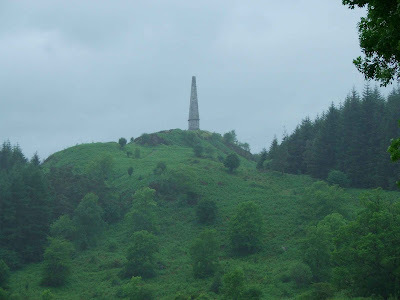 The monument was bankrolled by James Bateman of nearby Tolson Hall, as a memorial to the exile of Napoleon on the island of Elba. There was meant to be a commemorative plaque when it was originally erected, in 1814, but Napoleon escaped his island exile on the 26th of February 1815. It took one hundred years for James Bateman's intended words to appear on the monument. Above. The monument from the North East. The commemorative plaque was placed on the monument in 1914, and was paid for by Charles Cropper of Ellergreen. The original plaque appears to never have been found, though it is thought that it was produced and was ready to install when Napoleon left Elba for France. Above. The commemorative plaque on the monument. 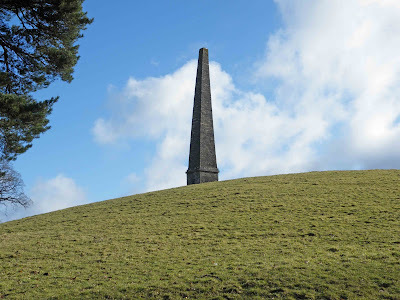 The monument is almost identical to the one on Castle Howe in the middle of Kendal, and was probably designed by the Webster family of architects.